Writers’ Huddle ran from February 2012 until April 2018. It became increasingly apparent in 2017-18 that the monthly membership model wasn’t a good fit for most of my audience, so I closed Writers’ Huddle to focus instead on running stand-alone online courses: you can find a list of these here. Each month, we have a brand new audio or video seminar, often with a guest speaker. These come with a nicely-edited transcript and a worksheet that recaps key points. We have a very supportive community in our private members’ forums (where we run regular Writing Challenges), and you can join us weekly in our new chatroom. You get our full archive of seminars (60 and counting)! You can download and keep all these, even if you later leave Writers’ Huddle. Membership of Writers’ Huddle is just $9.99/month. No-quibble refund: if you decide that Writers’ Huddle isn’t quite right for you, just let me know within 60 days and I’ll refund your first two months’ membership fee. If you live in the UK, you can either pay the dollar rate or pay a fixed rate of £7.49/month. I am enjoying Writers’ Huddle a lot. It has quickly become a vital part of my ongoing learning as a writer. I have already received some very helpful critiques of chapters of my nonfiction book and my blog posts and guest posts. The people in this community are warm and friendly and supportive. It’s a safe place to share your work and get feedback. And they are not afraid to tell you what they think, honestly and constructively. I value that. Ali Luke is endlessly inventive and has an uncanny way of targeting and providing the very information we all need in order to improve our writing skills. I highly recommend this community. Joining the Huddle has been a great step for me. It’s given me an opportunity to chat with fellow writers on a daily basis. I’ve received constructive feedback from other Huddlers on pieces offered for critique that immediately improved my own writing. I’ve swapped links on writing tips and greatly enjoyed discussing books on the craft that we’ve read together. I look forward to being part of this community as I continue on my path to being a published writer, because I know I’ll be the better for it when I get there. I have learnt a lot in the few months that I’ve been a member of the Huddle, both through the seminars and Q&As as well as on the forum, gleaning advice from other members. Being in a community of writers has also given me the confidence to write my first guest post (which was accepted) after three years of blogging! In Writers’ Huddle, we run Writing Challenges twice a year to focus on meeting goals together. This year’s Summer Challenge begins on Monday 24th July and runs until Sunday 3rd September. We’ll be setting goals together from Monday 17th July. Members sign up on the forums and set a target (either a weekly target, e.g. 1000 words per week, or an overall target for the six weeks, e.g. finish three chapters of a novel). Each week, members taking part “check in” to let us know how they got on. There’s a weekly $10 Amazon voucher prize for one lucky winner who “checked in” that week. Members who’ve taken part find that the Challenges really help boost their motivation and their word counts. Maybe our Summer Challenge could be just what you need too? The seminars are normally audio, sometimes video; each one has a full transcript, nicely edited for readability, and video seminars also have an audio plus PowerPoint slides option (in case you don’t like watching video or your computer isn’t up to it). Every seminar also has a worksheet that includes a summary of key points, a practical exercise, and suggestions for further reading or extra resources. As a Writers’ Huddle member, you’ve got access to me through our private members’ forums, or, if you prefer, by email. We also have a chatroom where we hold weekly live chats: you’re very welcome to bring your writing questions there (or simply drop in for a chat). We’ve been going since February 2012 – so there are 60+ past seminars for you to check out, whenever you want. The archive is searchable and seminars are tagged by topic, to make it easy to find the ones that are most relevant for you right now. You can even download the seminar files to your computer so that you’ve still got them if you choose to leave Writers’ Huddle at any point. Don’t worry about forgetting or missing out on the content here: each month, I highlight specific past seminars in the weekly emails, and I also link to relevant ones in each new seminar’s “Further Reading”. These are normally $39.99 each, but you pay just $19.99 per course. You also get a 50% discount on my Blogger’s Guide ebooks, which are normally $29: you pay $14.50. Right now, we have regular Challenges, a “buddy” system, weekly chats, and of course the forums where anyone can start up a topic for discussion. If you’re having a bad writing week, if you want some critiques of your work-in-progress, or if you just want to hang out with other writers, we’re here for you. There’s a special forum, “Introductions”, where you can tell us a bit about you and your writing – lots of our old-time members make a point of popping in there to welcome new faces and to offer support and encouragement. 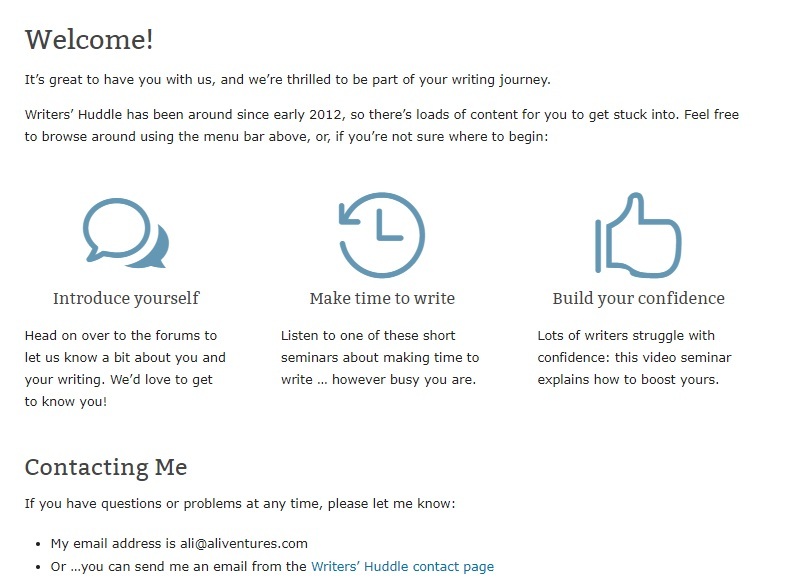 Writers’ Huddle costs $9.99/month, and you can cancel at any time. I want you to have plenty of time to try out Writers’ Huddle, so there’s a 60 day money-back guarantee: if you decide Writers’ Huddle isn’t quite right for you, just email me within your first 60 days and I’ll refund your payment(s). All seminars are audio or video with a nicely edited transcript and a summary of key points in the worksheet. What Will You Write in 2017? We’d love you to be part of our writing community. There’s a 100% no-quibbles money back guarantee, so you’ve got nothing to lose!